Magic was Becky’s first “serious” dog. Becky had focused on working with horses for most of her life and had only had dogs as “pets”. She acquired Magic with the idea of training him and doing things right. Luckily, Magic turned out to be the perfect dog. He tried hard to do everything that was asked of him. 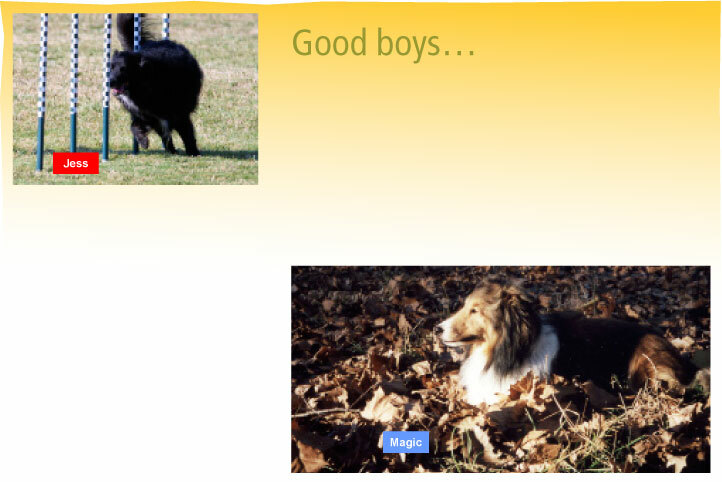 Although he didn’t have any titles, Magic supported Becky’s attempts in competitive obedience, agility, K9 games, pet therapy and rally obedience. Jess was living wild in a state park in Northern California before being trapped by a park ranger. He had great survivor skills and a huge chip on his shoulder. One agility instructor said Jess was the perfect agility dog – except for his personality and disposition. But with lots and lots and lots of work, training and behavior management, Jess decided that agility = treats, nice people and good times. 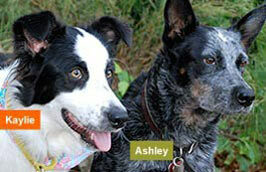 Ashley’s story is typical of many herding dogs. Cute puppy, no training, becomes a very destructive adolescent, ends up at the pound slated for euthanasia. In addition to her behavior issues, Ashley also had severe food allergies. After six months of research and trial and error, Ashley’s allergies were identified and she was on her way to being a healthy dog. The things that got Ashley in trouble early on, her drive and her brains, made her the perfect performance dog. Ashley excelled in obedience and herding as well as agility, earning multiple titles in three agility organizations and two herding organizations. Unfortunately, in November 2006, Ashley suffered a spinal injury . After two years of physical therapy, Ashley returned to limited competition in the spring of 2009. KayLee is a truly recycled dog. She was dropped off at a recycling center (along with a sack of cans) when she was less than five weeks old. Luckily, she was turned over to Border Collie Rescue and put in an excellent foster home. Becky acquired her when she was about five months old. KayLee is full of life and happiness. Although Becky sees potential for herding, agility, obedience and therapy work, right now KayLee is excelling in being the perfect companion. Becky started training dogs professionally in 1994, teaching pet obedience classes for Oz Dog Training in San Jose, California. 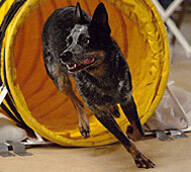 She was first exposed to agility at the Santa Clara State Fair in California. Becky was doing obedience demonstrations with her Shetland Sheepdog, Magic, but kept being distracted by the excitement of the agility ring. She started agility with Magic but a shoulder injury limited his progress. She acquired a Border Collie, Jess from a California rescue group with the plan to do agility with him. Jess, turned out to be a dog with many behavior issues, including severe aggression toward both people and dogs. Becky’s agility plans were put on hold while she learned every thing she could about aggression and behavior management. 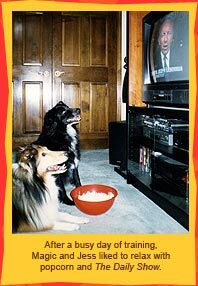 In 1998 Becky moved to Austin and started her business, Pawsitively Dogs. Becky taught pet obedience classes at the Austin Humane Society as well as doing some behavior consultations. She also began teaching agility classes. In addition to pet obedience classes, Becky taught Canine Good Citizen classes (and is a CGC evaluator), Rally Obedience classes, puppy classes, clicker classes and trick training classes. She was also a Head Start trainer for Town Lake Animal Center. Becky is now a full time agility instructor with over eighty students. She is a member of Austin K9Xpress and the Travis Agility Group. Becky has been a member of the Association of Pet Dog Trainers since 1996. Becky focuses on reward based training. She has experience working with a number of different breeds. She especially enjoys working with the non- traditional agility dogs as well as dogs with fear and confidence issues. Her goal is to have classes that are personal and positive, supportive and fun for both the handler and the dog.